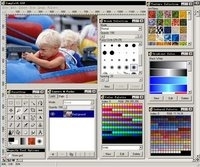 PaintStar is now distributed as freeware. Feathering,sharpening,shrinking and growing the selection supported. Text Tool improvements: You can preview the text effect in text enty box. Added texture option to Paintbrush. Yon can use the selected texture in stead of the current foreground color. Added more than 40 different brushes. Bitmap Brush supported. You can create any shape brushes. PaintStar is a versatile digital image processing software suitable for such tasks as retouching of photographs, composing and authoring images, image morphing, screen capture, and displaying image thumbnail in Windows Explorer context menu. It supports alpha, layer, path ,and the most common editing techniques. PaintStar has many of the tools and filters you would expect to find in commercial offerings, and some interesting extras as well. Gradient Fill tools include linear, radial,square,conical(symmetric),conical(asymmetric) and shapeburst. Multiple colors supported. Selection tools including rectangular, elliptical, free, fuzzy and paths. Add, subtract, invert, antialias and feather selections supported. Zoom10% - 2000% display, and show grid supported. More then 30 File formats supported include JPEG, GIF, PNG, TIFF, TGA, PCX, BMP and many others. Color conversion supported include several different dithering methods and palette options. DisplaysHistograms (RGB, HSV, HSL, CMYK). TWAIN supported for scanners and digital cameras. MultipleLayers, 26 methods of combining modes suppported. Multiple Undo and Redo supported. You can set up the number of Undo's from 3 to 99. Microsoft Windows 95, 98, Me, NT 4.0, 2000, or XP. 4 MB hard disk space. Video display of at least 256 colours. Beginner lessons created by Marianne.